We left the day with much to think about, but four main themes struck us especially. There was a marked consensus that states are still the primary actors in international relations, and will likely remain so for the foreseeable future. This came through the most acutely, and perhaps paradoxically, in the panel on non-state actors, when Emma Ashford posited that nearly all non-state actors are either state-sponsored or “state-focused.” In other words, most non-state actors are relevant to US and global security only through their relationship to a state, from insurgent groups hoping to take over or form a state of their own, to terrorist groups that wish to destabilize the state and rely on state (over)reactions, to mass movements hoping to extract concessions from a government. The conference reminded us that states have long been and will long remain the organizing principle of international relations. Those of us who focus on conflict and violence tend to see the glass half empty. The Future of Force conference was no exception – but we did not have to listen too closely to hear plenty of reasons to be optimistic about US and global security. Regional experts touched on the variables pointing toward conflict as well as those pointing away from it. Yes, China and Russia have conflicting interests with the US and current American and Russian leaders especially enjoy saber-rattling, which always has the potential to lead to crises. Yet all three powers share an (at least short-term) interest in avoiding war, and all have demonstrated a desire to manage escalation risk. The experts also expressed optimism about risks of entrapment, noting that Russia and China have made it clear to their clients that security guarantees are off the table. Panelists expressed concern that the US is lagging behind China and Russia on military applications of some emergent technologies. In order to catch up, they advocated for more direct engagement with industrial policy as a key element of foreign policy. Many emerging technologies give the advantage to the offense, reduce barriers to entry for hostile actors, and thereby make it possible for a wider range of hostile actors to do greater damage than previously possible. On the positive side, however, some of these same technologies have the potential to dramatically improve human existence: for instance, synthetic biologists are working to cure all human disease within the next 100 years. Katherine Charlet appealed to policymakers not to sacrifice these potential advancements by militarizing technologies too quickly. The panels purposefully brought together academics and practitioners on each topic. All of these participants referenced (either explicitly or implicitly) a range of frameworks and theories from international relations and political science writ-large, showing that cross-pollination between academia and policy is both possible and vital. The organizational pathology lens of foreign policy decision-making, made famous by Graham Allison, was the clear winner of the day. For each set of problems facing the US, a primary frustration of policymakers was the difficulty of seeing across silos of functional and regional expertise to efficiently pool the necessary knowledge and resources to build an integrated solution. Panelists also lamented that organizations rarely develop the proper metrics to judge their own performance, hampering the US government’s ability to learn from its mistakes. Interestingly, the panels also emphasized that international stove-piping exists; intelligence-sharing among foreign partners – and among different states’ law enforcement agencies – is a large barrier to combating transnational threats. Misperceptions and bias were also not-so-subtle undercurrents in the discussion. For example, Olga Oliker claimed that Russia is unable to understand US normative commitments because it assumes all states are as Realpolitik in their orientation as Russia; and Oriana Skylar Mastro argued that US attempts at issue linkages assume (perhaps wrongly) that China also thinks in those terms. Ciara Knudsen argued that states struggle to productively engage with non-violent movements because they impose their own hierarchical structure onto often decentralized movements and have little idea of how to deal with a movement without a unified vision and leader. Finally, the influence of deterrence and spiral theories—and, relatedly, offense-defense balance—was pervasive. Although they never articulated it directly, several experts seemed skeptical that inter-state war would come as a result of accidental spiral due to entrapment or misunderstanding. Instead, they suggested that war between the US and Russia or China would more likely follow from a clash of interests – implying that deterrence is king. Still, despite an initial rejection of the spiral model, later panelists reminded us that most emerging technologies favor the offense, which has a destabilizing impact on interstate relations, enhancing crisis and conflict escalation. What were the major lessons learned for the applicability of theory to policymaking? At least two flowed from our discussions about the Future of Force. First, the most intuitive theories fared the best, whether because they stuck in the minds of policymakers the most, or because they actually originated from policy circles due to their grounding in policy experience. Second, descriptive frameworks or concepts are as important as causal ones to structure thinking, especially under the unique time constraints of policymaking. The final panel took on the academic-policy gap head on, brainstorming new ideas for academics to better engage with different levels of policy and military planning (and vice versa), such as programming to help academics translate their findings to the proper audiences and efforts to help the policy world more systematically share data with academe. 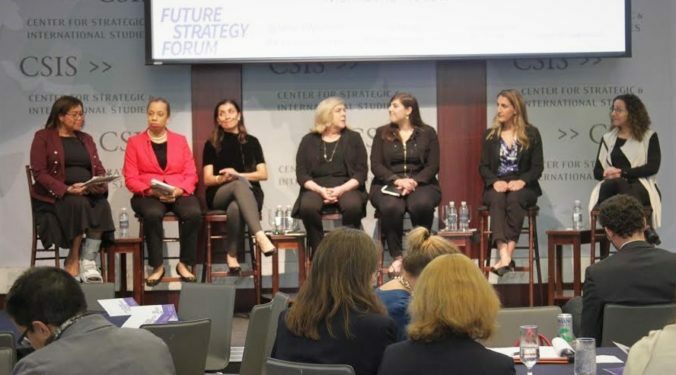 In crafting the first annual Future Strategy Forum, we deliberately constructed all-women panels inclusive of a variety of perspectives and backgrounds. But what initially seemed like a novelty – that all featured speakers were women – quickly faded into the background as the discussions among these impressive experts picked up steam. Moderators and panelists engaged in wide-ranging, provocative debates, and the refrain most frequently heard at the end of the day was that the conference “felt so normal!” Otherwise put, the conference taught us, as intended, about the Future of Force. The Future Strategy Forum is proud to be a part of a larger movement to amplify the voices of women in national security. From CSIS’s Smart Women, Smart Power’s long list of podcasts and speaker events, to our bridging-the-gap discussion about the Future of Force in May, to the Truman National Security Project’s 2018 three-day conference in June, to the upcoming #NatSecGirlSquad conference and more, all-women expert panels are making clear that there is no dearth of female powerhouses in the international security space. Broader efforts such as War on the Rocks’ Bombshell podcast and #womenalsoknowstuff are also amplifying the expertise of women in policy, the media, and beyond. The Future Strategy Forum remains committed to featuring all-female voices on the major issues facing US foreign policy every year. For more takeaways from the May 18th discussion, check out the latest War on the Rocks Podcast, The Future of Force, featuring us and fellow organizers Kathleen Hicks, Alice Friend, and Alex Bick with hosts Ryan Evans and Usha Sahay. We hope readers will join us in spring 2019 to learn from another impressive group of foreign-policy experts from academia and policy – who also happen to be women. it so great that we have women to talk about new ideas in IR: organizational politics, misperception, spiral theories and the O-D balance. Such a fresh and new perspective.